Note: I’m out-of-town this week, so this post is going up automatically. I remember it like it was yesterday, but it was actually almost a year ago. It was the morning after we brought the girls home. 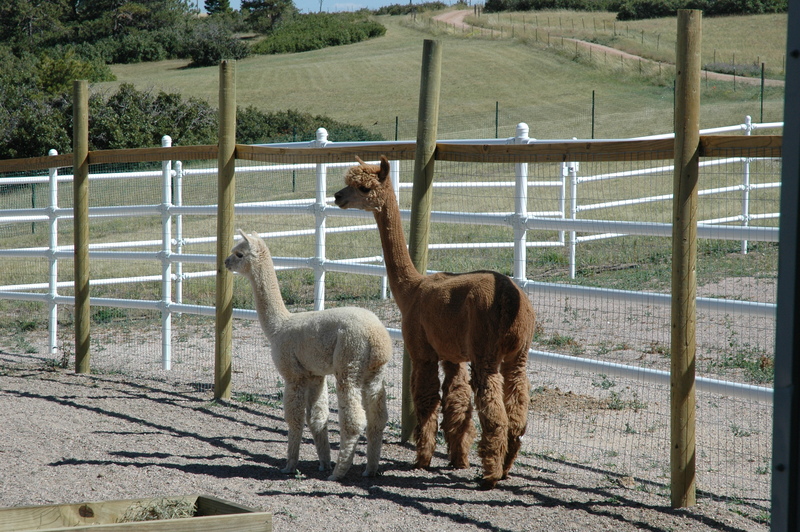 After months of preparation, endless hours of fencing and levelling ground, and much worry, we had our alpacas on the ranch with us. The horses weren’t yet, but they were so close to being home we could taste them…or something. The horses arrived a few months after the alpacas. 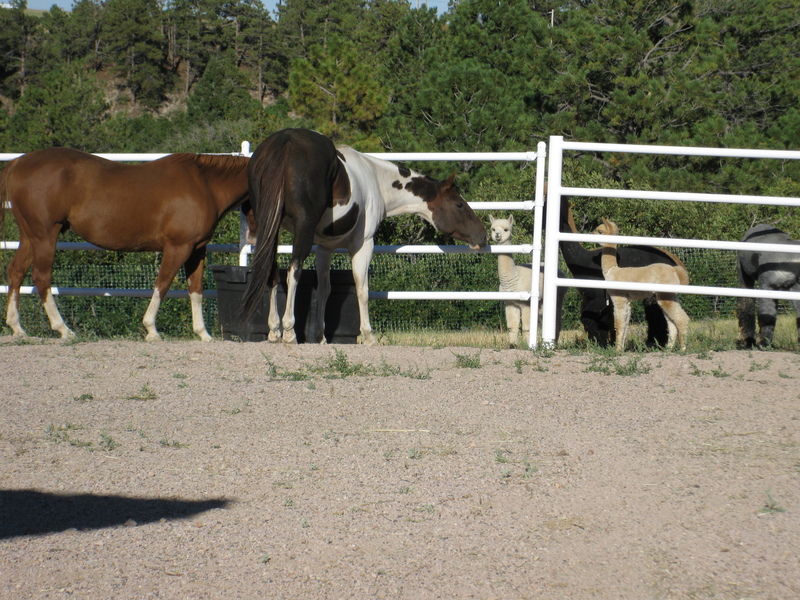 This is one of their first meetings, always through a fence. Mornings on the ranch are a miracle. The light has this tone, a golden amber that is crisp and warm at the same time. Mom had gone out to check on the ‘pacas, and give them their morning crumbles (it’s a treat-like supplement) and Dad was going through the ritual coffee dance. I went out to the barn to get Mom for breakfast. A ranch kid to the core, I was appropriately dressed, of course. I think I was wearing flip flops, boxer shorts, and a tank top. Oh yeah. Be prepared. I was leaning on the stall door enjoying the sun while Mom finished up when it happened. Tulip began to choke on her crumbles. The people we bought them from warned us about this peculiar (and terrifying) alpaca thing. I think at least 2/3 of us were wrestling with nervous alpacas at the time, but it went something like this: alpaca necks are very long, and when they eat too fast, or eat things they wouldn’t normally eat in the wild (like pellets), food can get stuck in their throats. Tulip began to cough, loud, far apart coughs that expelled chewed food, but didn’t seem to be slowing down. We watched her for a bit. Remember, they hadn’t even been in our care for a full day yet. “Do you think this is choke?” Mom asked me without looking away from Tulip. I had no idea. We decided to do something; it wasn’t getting any better. As we approached Tulip, nursemaid Brittany tried to intervene, body checking me as Mom tripped over Tuscany. I shoved Brittany off, and we managed to grab Tulip. We felt along her neck, searching for the blockage. Thing is, neither of us had ever felt an alpaca neck before. We were supposed to be “massaging the blockage firmly” to break it up, but we didn’t want to, like, crush her windpipe or something. A splatter of spitty hay goobers hit Mom’s chest as we frantically felt up and down Tulip’s neck. Tulip and Tuscany last September. He stuck to her like glue, especially when she was stressed out. Brittany crashed into me again, clucking. I took the opportunity to grab her neck, and felt it up. She didn’t have any lumps anywhere, so the thing low on Tulip’s throat had to be the food. We massaged it, kinda forcefully, for a bit before Tulip managed to break away from us. She coughed a few more times and then began to chew. We watched for a few more minutes, hands shaking and knees knocking. I retrieved a flip-flop. Tulip seemed fine, a little stressed out, but fine. “Breakfast?” Mom suggested, wiping green alpaca spit off her shirt. This entry was posted in animals and tagged alpacas, choking, trouble, vets. Bookmark the permalink.